Basingstoke, UK. 8th April 2018: Sony has today expanded its Large Format Sensor category with the launch of the new XDCAM handheld camcorder FS5 II (Body: PXW-FS5M2, Lens Kit: PXW-FS5M2K). Complete with stunning 4K¹ HDR and 120fps² performance and RAW capabilities, the new Super 35 mm camcorder marries outstanding image quality with an ergonomic modular frame, offering content creators ultimate creative flexibility. In addition to S-Log 2/3, the FS5 II offers Instant HDR Workflow to produce HDR content for quick post-production without the need of grading. The FS5 II is a great E-mount camcorder for interchangeable lens camera users, offering boundless creative options for web commercial, music video production, dramas, corporate & event videos and documentaries. Tuned to meet the requirements of today's content creators, the FS5 II features an all-new look with a refined picture tone to capture natural highlights, subtle, alluring and well rendered facial tones and a softer tonal look emphasizing portrayal of a person. Using the accumulated expertise of Sony's digital cinematography camera VENICE, it promises a fresh and vivid look while still retaining plenty of creative options in post-production thanks to its high performance 4K Super 35 Exmor® CMOS sensor. Claus Pfeifer, Head of Technical Sales -- Media Solutions, Sony Professional Solutions Europe explains: "When Sony develops new camera technologies we gather feedback from all ends of the production chain -- from DOPs through to post production around the workflow. This camera was no exception. We've evolved and developed our hugely popular FS5 with default shooting capabilities and the FS5II is now a powerful addition to the Large Format Sensor line-up which promises even more flexibility and creative choices." The FS5 II builds on Sony's heritage for image quality, delivering stunning High Frame rate shots supporting four seconds of 120fps in 4K and continuous 240fps in 2K RAW output when used in partnership with a compatible external recorder. Of course, continuous 4K 60fps*⁷ RAW output is fully supported. On the other hand, on to an internal SD card, the camcorder also offers High Frame Rate (HFR) recording at Full HD 10bit 4:2:2 image quality and a frame rate of up to 240 fps of 8-second cache recording, allowing up to 10 x slow motion⁸. Continuous recording of 120fps in Full HD is also supported.\ With an Instant HDR Workflow*³ users can now reduce time in post-production and produce high-quality HDR content quickly without the need of grading. Whilst for productions of longer lead-times, S-Log 2/3 allows the HDR image to be fine-tuned via color grading. Lightweight but robust, the FS5 II's well balanced 0.8kg body, adaptability and creative features make it a perfect fit for movie shooting, whilst its modular design makes it easy to reconfigure for any application including mounting on a gimbal or drone. Sony's unique Electronic Variable ND filter with Auto ND function covers a wide range of exposure adjustment as well as creating a wide range of shallow Depth of Field control. Now with ten Picture Profile settings the FS5 II allows users to instantly and easily configure the camera for different shooting styles, such as cinematic content creation and online content. The FS5 II will begin shipping across Europe in May. I am totally confused. These specs are EXACTLY the same as those of the current FS5, with the RAW and 120P upgrades. Exactly the same both externally and internally. And yes, the current FS5 has 10 Picture Profiles, including "HDR Instant Workflow," which is just HLG. Yeah the lack of specifically mentioning if the 2.5K internal is 10bit means I'm sure it doesn't have it. Yes, it sounds almost identical to the current FS5. I have a question that I hope someone can ask Sony at NAB - is the sensor the same? I'd be 90% sure it is the same, but would be worthwhile asking to be certain. There actually is a big improvement - the ND control knob is now black on the FS5 II instead of the silver on the old model. This was in fact the number one complaint of users. Sony prides itself on listening to its customers. Price is $4750, same as FS-5. 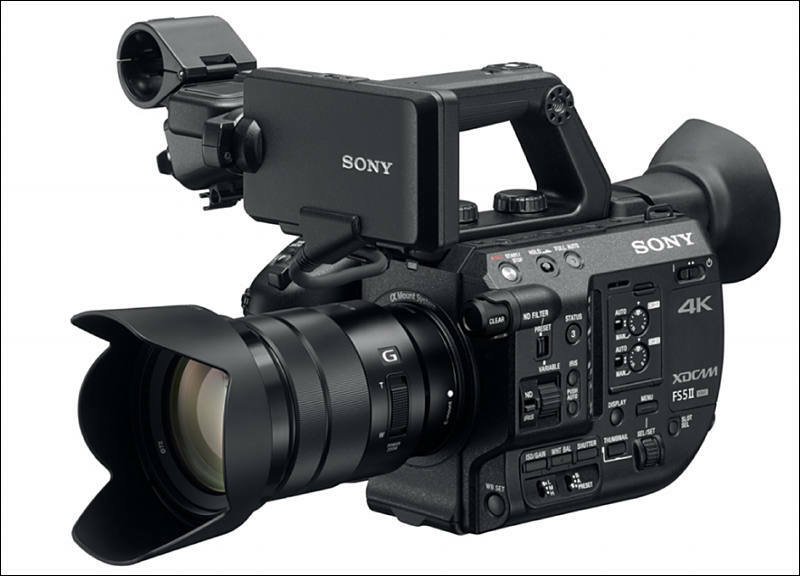 If you want to 'upgrade' from FS5, Sony wants you to buy an FS7. it seems that Sony added a new gamma curve that matches a Venice 709 curve. This is kind of a big deal since currently you can't get good color out of an fs5 without shooting slog and you cant properly monitor slog without an external monitor with LUTs. Yes, there are still few cameras that can shoot this. This was shot to assess the Sony DT 55-300mm lens ($298). My understanding is that Sony actually changed sensor, not much, most probably few tweaks and slightly different color filters. At least it is clear words of Sony representative that sensor changes are hardware. I heard the interview. I listened twice. It was PRspeak. It was not so clear - since at the end of the description it seemed it was in a Picture Profile. In Slog2, did they really change the SGamut color space? I really do not think so. And my video was shot from RAW output - that is, before the processing. If these tweaks are from processing differently what comes from the sensor, then maybe they would be irrelevant to externally recording from the "new" FS5 II. Or, maybe not. Perhaps the interviewer could have asked more specific questions - what changes will one see from recording from RAW? Will all PP's "benefit" from these tweaks? Well, he clearly said hardware. Period. And again, we even have topic about sensor color filters. It is exactly Alexa and top Sony cameras who have filters closer to human eyes. "In two other interviews Sony says the hardware is identical. Also it would awfully weird if standard profile from both Mon and mkii didn't match (slog, cine)"
"Is there a single hardware change to the FS5II? I saw an interview that said no. This really confused me. The whole point was to update colour science to match Venice. What other camera in the Sony range has colour match to Venice? (serious question, Im ignorant on that). My thought though was couldn't this have been a firmware update to existing cameras? Only going on the one Sony rep interview I saw. " Maybe if interviewers asked more probing questions we would actually learn what we need to know. Sorry - no hardware changes to the FS5 II, from clear speak of a knowledgeable higher up from Sony. Two "interviews" (official Sony one and Cinema5D) with Klaus Pfeiffer, the Sony rep. on the FS5 II. He makes it very, very clear using the same words that the sensor is the same and the electronics are the same as on the FS5 and that only the Standard non-profile has the Venice Color. No changes to any other Picture Profile. No additional capabilities that cannot be now added on via paid firmware upgrades to the FS5. Of course there is that hardware change - the ND filter knob is now black. Does not matter how many things this guy told this. I dont think this is an earth shaking issue, just that it seems now Sony is being very clear on what has not changed. But once someone has a version ii I am sure there will be lots of actual comparisons to check by picture profiles.